The reader is subject to serial passions. One series is a fascination with the Adams family. After reading about John Adams, Abigail Adams, John and Abigail’s marriage, John Quincy Adams — the reader took up The Education of Henry Adams . This was not her first attempt, but she was determined to see it through to the end. It took great determination; at the end of Disc 16, she let out a whoop of relief. Some parts interested LLC: the view of the War Between the States from England; his perspective on Henry Cabot Lodge and Teddy Roosevelt; his opinion of politics, the extensive travels. Other parts, e.g. conflict between Lord Palmerston and Earl Russell, were snoozers. LLC lacked the mental agility to follow the philosophy of the Unity and the Multiplicity. How a man who was a Darwinian for fun, inclined towards anarchy, became enamored with the Virgin Mary…that confused LLC. The distance in thought between John Adams and his great-grandson Henry Adams — more confusion. Henry Adams omits twenty years of his education, the most painful span of his life. In those decades he married his wife Clover; twelve years later she, in a bout of depression, committed suicide. Some are aghast that Adams does not mention his wife, but LLC believes the omission is consistent the clinical tone of the book. Adams closes the book, writing about 1905, “For the first time in fifteen hundred years a true Roman pax was in sight…” Tragically, the twentieth century was the least peaceful period of history. 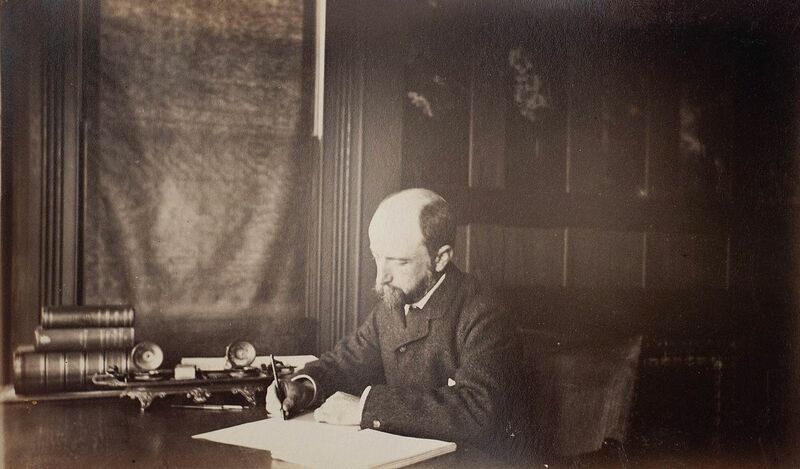 One element is memorable: Henry Adams writes his autobiography in the third person. LLC decided to mimic Henry in this review. If one wants to glean the pithy quotes, one does not need to read 505 pages or listen to 16 discs; look here or here or here. LLC finds that one book completed yields two books to finish: Henry Adams’ Mont Saint-Michel and Chartres (and then it is good-bye Henry!) and David McCullough’s The Greater Journey, Americans in Paris (but McCullough is always a hello!). This entry was posted in Audio, Autobiographical, book review, Books, Quotes and tagged europe, henry adams, turn of century by alivingpencil. Bookmark the permalink. Now, don’t be hasty. I could easily tick off a handful of books LLJ has read that remain unread on LLC’s shelf. Can anyone say Sertillanges? It seems that LLC and SS both have learning on their “blog” minds….the significant! difference is the subject matter…it’s like chalk and cheese!! Your reading accomplishments are remarkable! I took a seminar class in college on the Adams Family. It was taught by Russell Kirk and we were assigned books all written by members of this esteemed American family. The Education of Henry Adams and Mont St Michel and Chartres remain on my book shelves. As an 18 year old, I could barely follow Kirk’s lectures and he graciously allowed me to write my final paper on the lovely Abigail. This is a true example of the adages that *education is wasted on the young* and *a sieve at least gets wet*. Thank you, Dana. It helped to listen to the book while I walked. I haven’t found a (free) audio version of Mont St Michel, so it has been languishing on my bed stand!